I realized a couple months ago that I was consistently increasing the font size on my own site, and that I couldn’t read the light grey text in the sidebars comfortably, so I’ve done a little re-work. 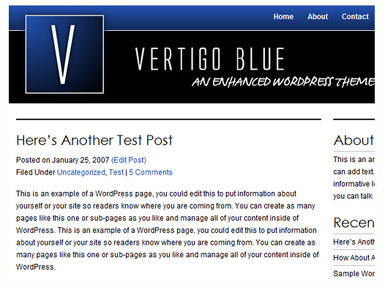 The WordPress template is Vertigo Blue Theme by Brian Gardner. I’ve also made category archives available, and have started working my way back through over 300 uncategorized posts. Let me know if you see anything glitchy. I have to say it looks pretty good, although it feels sort of lopsided. Since you have two side bars, can you put the article/entry/whatever in between them maybe? As it is I find myself ignoring the content and staring at the exceptionally massive list of links. I started staring at everything and realized I don’t need two sidebars – the footer functions as a sidebar. So now there’s only one, which leaves more room for the post content. I removed the del.icio.us linkroll temporarily – I’m trying to figure out some way to show a random sampling of blogs, rather than all of them. How do you post to this site? Only certain threads (like this one) allow comments. Comments are closed on posts older than 60 days. Comments are moderated on posts older than 21 days. Comments are open on recent posts. Or is it that the link to add comments isn’t obvious enough? The changes you made since my comment look much better, and make this quite possibly one of the easiest to read sites I scroll through. Gorgeous! I’m only sorry I didn’t comment sooner. The pen is a nice touch – very old school. Yours is one of the only blog sites that I can read as-is, without my black-on-white linearizing style sheet turned on. (I love OmniWeb’s site-specific preferences). Excellent redesign, I’ll be pointing people to it! Wow, jesse, glad to hear it. I’m a big fan of Opera’s User Mode (turns off stylesheets, using the local stylesheet if there is one).